Chatteris cueman Joe Perry set up a Masters final with reigning champion Ronnie O’Sullivan thanks to a thrilling comeback win last night (January 21). Perry was trailing 5-2 in his semi-final against last year’s runner-up Barry Hawkins, but won the eighth frame despite needing a snooker. He followed that up by winning the next three, including a break of 70 in the decider, to take the match 6-5 against his best friend on the circuit. The Fenland Potter described the win at the Alexandra Palace as the best of his career. Perry said: “I really can’t believe it. When Barry potted the ball to leave me a snooker, I was thinking about what to say to him and wish him all the best for Sunday. This game is mad, it never ceases to amaze. 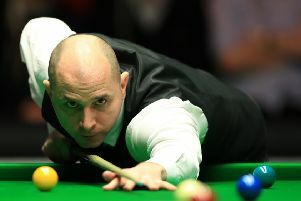 Perry (42) had never before reached the semi-final of this prestigious event. He beat world number two Stuart Bingham and Chinese ace Ding Junhui, both by 67-1 margins, to reach the last four. He will start as long odds underdog against O’Sullivan in today’s final (January 22, from 1pm). O’Sullivan beat Marco Fu from Hong Kong 6-4 in his semi final. Watch the London Masters LIVE on Eurosport 2, featuring daily studio analysis from Ronnie O’Sullivan, Jimmy White and Neal Foulds.